Barbecuing fruit intensifies its flavour. 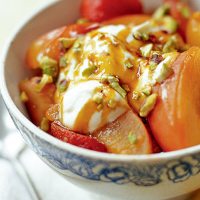 Finish off this low fat pudding with a spoonful of Greek yogurt, a drizzle of caramel and chopped pistachios. Cut the peaches and plums in half, remove the stone and cut each piece into quarters. Hull and quarter the strawberries. Then tear off 6 squares of foil, large enough to hold the fruit when folded to double thickness. Divide the fruit equally between the folded foil squares and partially bring up the sides to hold in the juices. In a small jug, blend together the orange juice, brown sugar and vanilla extract. Divide the juice between each parcel and loosely seal each one. Cook on the barbecue for 10-12 minutes (this will depend on how hot your barbecue is), but check halfway through the cooking time. The fruit is ready when it softens slightly to the tip of a sharp knife, but without being too soft. Open each parcel, transfer to 6 serving bowls and top with a spoonful of yogurt, a drizzle of caramel sauce and a few chopped pistachios. Another way of telling when the fruit is ready is when the parcel puffs up. The caramel sauce can be used as a topping for ice creams, sundaes or on pancakes and fresh fruit. Instead of using a barbecue, the fruit can be cooked for 10-15 minutes in a preheated 200°C, gas mark 6 oven.